Grand Cru location or appellation in the area of ​​Côte de Beaune, the southern part of the Côte d'Or, It covers eight hectares of vineyards, which share almost exactly half of the two neighboring communities of Chassagne-Montrachet (here the location is referred to as "Le Montrachet") and Puligny-Montrachet (here "Montrachet"). The location has been known since the 13th century and was known under the names Mons Rachicencis, Mont Rachaz, Mont Rachat and from the 15th century as Montrachat. Towards the end of the 19th century, the names of these communities were added to the village name. Of the ground In the lower part consists of a 50 cm thick layer of brown limestone weathering debris. The location is surrounded by a wall ( Clos ). Here only white wine of the variety is sorted Chardonnay produced. He is one of the best white wines in France and the world. The famous writer Alexandre Dumas (1802-1870) remarked, overwhelmed, that one must enjoy the Montrachet white wines "kneeling and with bared head". They are characterized by a honey-like aroma with a peach and apricot bouquet. The wines of the predominantly south-facing vineyards of Chassagne are considered more massive and fat, those of Puligny as finer and more elegant. The less significant red wines are sorted Pinot Noir produced. 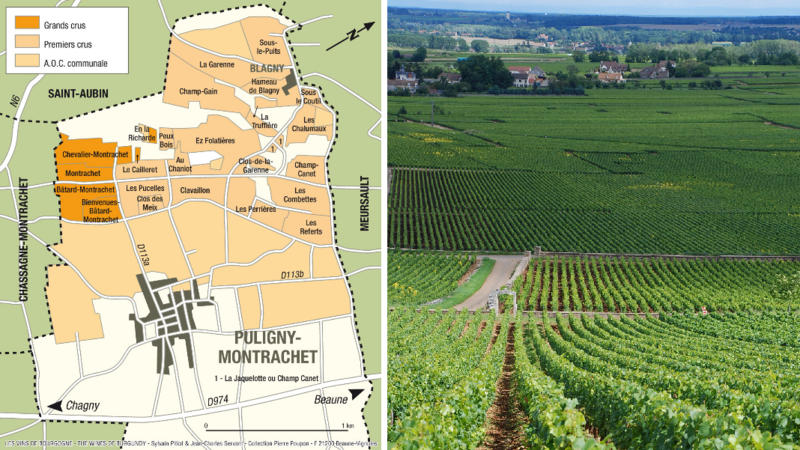 Of the five Grand Cru locations, two share the two municipalities, which are, as already mentioned, "Montrachet" or "Le Montrachet" (8 ha) and "Bâtard-Montrachet" (12 ha). In the movie "The Silence of the Lambs" Hannibal Lecter orders a Bâtard-Montrachet after his escape in a restaurant. The five Grands Crus are exclusively for white wines. Amiot-Bonfils, Auvenay, Belland, are among the best-known producers of Grand Cru and / or Premier Cru wines in one or both communities. Bichot (Domaine du Pavillon), Boillot, Bouchard Père et Fils, Carillon, Colin, Déléger, Domaine de la Romanée-Conti. Joseph Drouhin, Gagnard, Jadot, Lafon, Laguiche, Latour Louis. Domaine Leflaive, Morey, Niellon, Pernot, Ramonet, Sauzet and Thénard. The area covers 340 hectares of vineyards. To 60% red wines are produced. The three Grands Crus are Bâtard-Montrachet (6 ha), Criots-Bâtard-Montrachet (1.6 ha) and Le Montrachet (4 ha). The Burgundy classification second quality level of many Premier Cru locations covers about 150 hectares of vineyards. These are Abbaye de Morgeot, Blanchot Dessus, Bois de Chassagne, Cailleret, Champs Jendreau, Chassagne, Clos Saint-Jean, Clos Chareau, Clos Pitois, Clos Saint-Jean, Dent de Chien, En Cailleret, En Remilly, En Virondot , Ez Crets, Es Crottes, Francemont, Guerchere, La Boudriotte, La Cardeuse, La Chapelle, La Grande Borne, La Grande Montagne, La Maltroie, La Romanée, La Roquemaure, Les Baudines, Les Boirettes, Les Bondues, Les Brusonnes, Les Champs Gain, Les Chaumées, Les Chaumes, Les Chenvottes, Les Combards, Les Commes, Les Embrazées, Les Fairendes, Les Grandes Ruchottes, Les Grands Clos, Les Macherelles, Les Murées, Les Pasquelles, Les Petites Fairendes, Les Petits Clos, Les Places, Les Rebichets, Les Vergers, Morgeot (54 ha), Petangeret, Tête du Clos, Tonton Marcel, Vide Bourse, Vigne Blanche and Vigne Derrière. The Village Appellation covers about 180 hectares of vineyards. 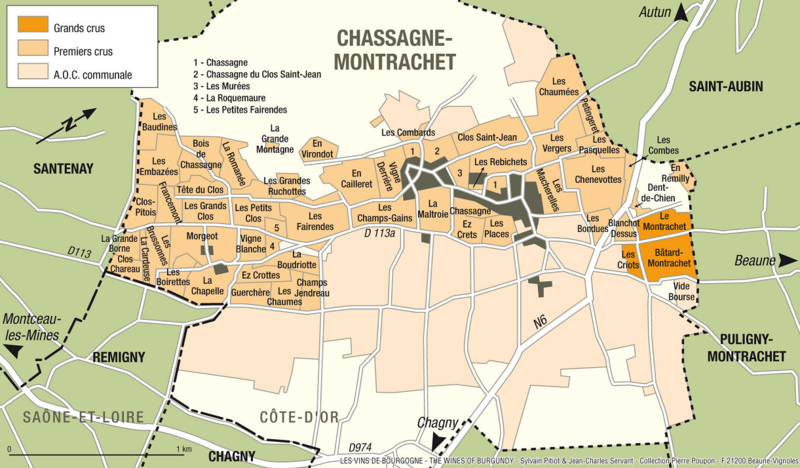 An alternative appellation only for red wines is Chassagne-Montrachet-Côte de Beaune . The area covers 235 hectares of vineyards. The four Grands Crus are Bâtard-Montrachet (6 ha), Bienvenues-Bâtard-Montrachet (3,6 ha), Chevalier-Montrachet (7,25 ha) a. Montrachet (4 ha). The Premier Cru locations cover about 100 hectares of vineyards. These are Champ Gain, Champs Canet, Clos de la Garenne, Clos de la Mouchere, Hameau de Plagny, La Garenne, Le Cailleret, Les Chalumaux, Les Clavoillons, Les Combettes, Les Demoiselles, Les Folatières, Les Perrières, Les Pucelles, Les Referts Sous le Puits and La Truffière. This page was last modified at 2 February 2018 at 12:38.